Though intended for authors, these guides would provide invaluable assistance in the creation of a historical role playing game campaign. Each one addresses a particular historical era. "So there's a few historical inaccuracies. So the cover is that goofy orange, with Queen Elizabeth (though she shows up nowhere in the book). So it's filled with silly photos taken from a low-budged Renaissance Festival. I still found this book EXTREMELY useful. The reviewer that said that you should use this as a springboard hit the nail right on the head. No, the facts aren't extremely detailed. No, they're broad-ranging. But it's enough presented here to get your imagination working, and several books are listed to check out for further information. I found the clothing timeline to be very interesting and detailed (and accurate for the most part). Plenty of information on festivals, holidays, musical instruments, vocabulary you might use, etc. There's even a nice long listing of saints, and some of the Crusades. The thing to remember is that this is a writer's guide only. If you're looking for quick facts, this book is perfect for you. If you don't want to fish around in 8 medieval textbooks to find out what your hero might have eaten for dinner, get this book. Sherrilyn Kenyon is a romance author and quite honestly, if you're a romance author looking to pick up some easy facts on English history for some research, this is your book. Those actually trying to do in-depth research will, most likely, be disappointed." ...from Amazon user "syriously"
"The Writer's Guide series is intended to "syntheize the many facts available into concepts that help you understand the period without excessive study," to quote the author's introduction, and in that this volume of it succeeds well. Of course, in a book of this size, such a large number of subjects can only be covered in a fairly superficial manner, but the extensive bibliographies do help by providing pointers to other useful works. And since social histories always tend to be thinner on the ground than mainstream ones (battles and kings and Parliaments), any comprehensive book on the subject is welcome. 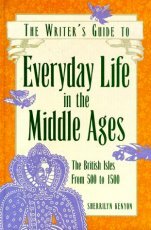 The book starts out with a general timeline, then offers a regional overview of the major developments and occurrences in each of four major regions, and goes on to touch on everyday life (food and drink, architecture, clothing and accessories, marriage and family), government and war (including "money, economy, trade, travel, and navigation"), and Colonial society (arts and sciences, trades, professions, religion). Period terms and unusual colloquialisms are emphasized by a special typeface. Though the illustrations are relatively few, they are clear and well-chosen, and there are several sidebars showing such things as weights and measures and the sequences of commands used in artillery and in matchlock-rifle companies. It may simply be because I don't often have occasion to look into social histories of this era (my period is more likely to be 1840-90), but I found that this one provided me with quite a lot of useful information. Writers and casual students alike should be able to say the same." ...from Amazon user "chrijeff"
"The lives of American Indians and the vital role they played in American history has been riddled with stereotypes and falsehoods. 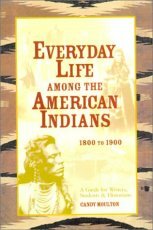 Everyday Life Among the American Indians corrects decades of misinformation with insightful, accurate scholarship that belongs on the shelf of anyone interested in reading--or writing--the real story. "This exceptional book will be applauded by writers, students, historians and casual readers alike. 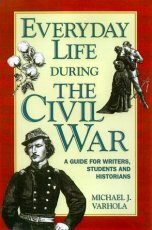 From soldiers and statesmen to farmers and firing lines, Everyday Life During the Civil War offers an in-depth exploration of this fascinating era. Using dozens of illustrations, timelines and maps, Michael J. Varhola illuminates the details of Northern and Southern economy; town and country living; food and the impact of war on diet; popular entertainment; clothing; military life; tools and weapons; slang and much more. 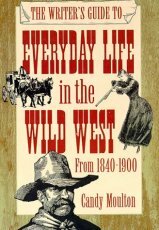 "More than just a reference book, this guide provides readers with an in-depth exploration of the lives and time of those on the frontier. 40 photos." 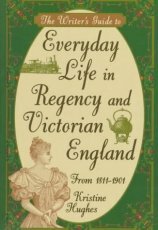 "While interesting and entertaining, this should not be considered a definitive guide to daily life in Regency and Victorian England. Kristine Hughes does a good job of giving the reader examples of historical writings on subjects such as etiquette and dress. Nevertheless, these few anacdotal resources do not constitute authoritative evidence that this is actually how people behaved in their everyday life. Just as a modern etiquette book reflects an idealized view of modern life rather than an accurate picture of how we really live, these original sources do not necessarily reflect the real lifestyles of the times. So long as you keep this caveat in mind, you will find this a very entertaining and readable book. The scope is extensive - everything from household appliances to travel to the various social institutions. There are many topics that will peak your interest, but consider this to be just the starting point for your research." 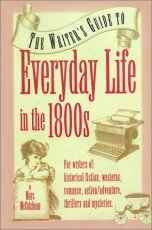 ...from Amazon user "seattleatty"
"Not just for writers, but historians, hobbyists, and anyone interested in the small details of life in other times. This volume, like the others in the series, includes chapters (with figures and illustrations) on food, clothing, family life, work, education, religion, leisure activities, social and political history, etc. Great for browsing, great for research. Well recommended." ...from Amazon user "RRiis"